In this post, BPC Archivist Anne Kumer shares some history. This post also appears on nyc circa, a New York city history blog. 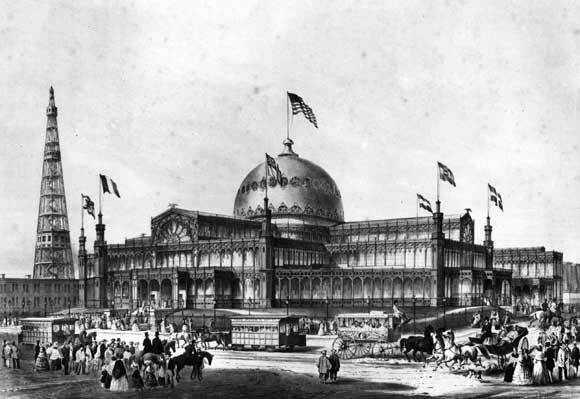 In 1853 the Crystal Palace was built on the present site of Bryant Park. 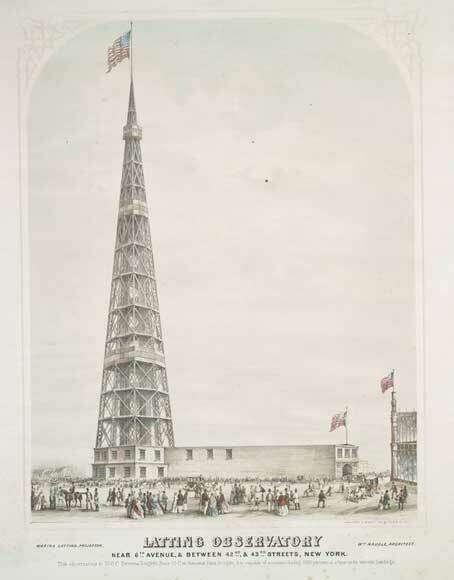 It was big, glass, extremely fancy, and modeled after the one erected in Hyde Park, London a few years before. Similar to the Hyde Park CP, the New York version housed a vast exhibition of the world's industrial innovations, consumer goods and artwork. The exhibits spilled out beyond the palace and onto bordering streets. Sideshows, food kiosks, makeshift zoos, and other attractions lined West 42nd and West 40th Streets. One of the most notable of these attractions was the Latting Observatory, a 315-foot tall iron and wood tower. Built on West 43rd Street with an adjoining structure that went through to West 42nd Street, the Latting Observatory was anticipated to be one of the "chief curiosities" in the city during the CP exhibition. Named after Warren Latting, and designed by architect William Naugle, the observatory afforded paying guests views to Staten Island, Queens, and New Jersey from three separate observation decks. The faux fish eye lithograph below shows the view from the tallest observation deck of the tower. 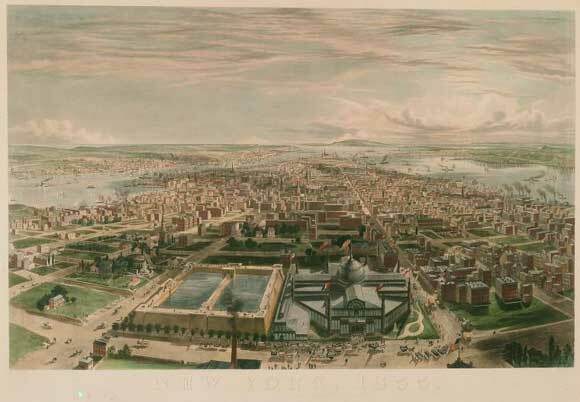 In the foreground, along West 42nd Street, is the Crystal Palace on the right, near Sixth Ave., and the Croton Reservoir (later the site of the NYPL) bordered by Fifth Avenue. The Latting Observatory was the tallest building in the city from the day it opened on July 1, 1853 until at least one year later, when the Crystal Palace exhibit closed in November 1854. After the closure, the observatory was bought by Hydeville Marble Works, who then removed the top 75 feet of the tower. Exactly one year after that, on August 30, 1856, it burned down in a fire started at a neighboring shop on 43rd Street.